I’m writing this during a break between performances of Holiday Brass. We’ve just hosted over 1300 people for a time of the finest musical celebration one could ever imagine. We’ll have just as many for each of the next three performances. That’s around 5,000 people coming through our doors! I reflected what it takes to host these concerts. It includes a professional and support staff that put in enormous extra time, and volunteers to help with traffic and greeting. Then, there’s the Chancel Choir. 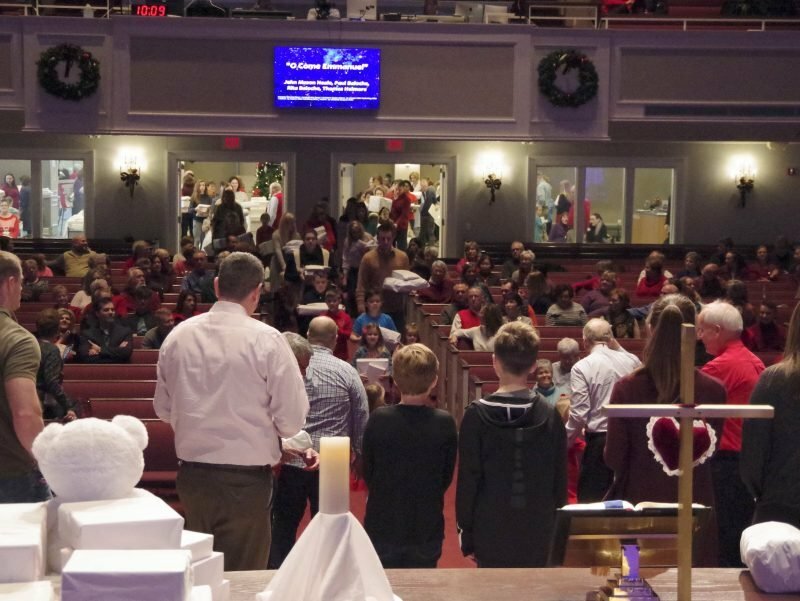 That prompted me to reflect on all the people who’ve worked and volunteered in so many ways for the many events that are part of Advent at Manchester UMC. All the way from the Christmas Tree Lot to Hanging of the Greens to Advent Breakfasts to Gifts in White…the list just keeps going on and on! As I thought about all this, a profound sense of gratitude overwhelmed me. So many people giving of themselves in so many ways. We’ll celebrate the gift of the Christ child in a couple of weeks. Maybe we should also celebrate the gifts people around here so lovingly give us as we prepare to greet that child. My gratitude list for people here at Manchester UMC is a very long one! Perhaps you’d like to create a personal gratitude list for people in your life. Family? Friends? Co-workers? Teachers? Classmates? Military and first responders? It might be inspiring to you to think of such people, put names with faces, and reflect on how they make your life better. Maybe even write them down and see how long the list grows. We are truly blessed in many ways. When I see your face here at Manchester UMC, I’m reminded of that! Remembering the ones who make a difference in our lives, in small or great ways, opens our hearts to welcome the Christ child, who became flesh and dwelt among us, full of grace and truth. When Jesus said you should love your neighbor as yourself, he’s implying that you are very worthy of being loved. In this series, we will celebrate your uniqueness and your potential. In the process, you will discover how God can use you in special ways for the spreading of the Gospel. I’m especially looking forward to our worship times together to start 2019. You’ll encounter dramas, videos, and music that will be very impactful.